Sherman Oaks, California--(Newsfile Corp. - November 6, 2018) - Petroteq Energy Inc. (TSXV: PQE) (OTC Pink: PQEFF) (FSE: PQCF) (the "Company") a fully integrated oil and gas company, is pleased to announce that it has received a Small Source Exemption from the Utah Department of Environmental Quality, Division of Air Quality for its Vernal, Utah facility. The receipt of the Air Quality Small Source Exemption at the Asphalt Ridge asset in Vernal, Utah comes just over a month since the Company initiated commercial production. Petroteq received an "Exemption" due to the Asphalt Ridge facility's estimated emissions being less than the level where a permit is required, further confirmation that Petroteq's process is an environmentally conscious method of oil extraction. Certain statements contained in this press release contain forward-looking statements within the meaning of the U.S. and Canadian securities laws. Words such as "may," "would," "could," "should," "potential," "will," "seek," "intend," "plan," "anticipate," "believe," "estimate," "expect" and similar expressions as they relate to the Company, including: the facility's emissions being less than the level required for an air quality permit; the facility going into production; the production capacity being 1,000 bod; the Company increasing its acreage; and the Company successfully developing block chain technology for the oil and gas industry and the anticipated benefits of such technology, are intended to identify forward-looking information. Readers are cautioned that there is no certainty that it will be commercially viable to produce any portion of the resources. All statements other than statements of historical fact may be forward-looking information. Such statements reflect the Company's current views and intentions with respect to future events, based on information available to the Company, and are subject to certain risks, uncertainties and assumptions. 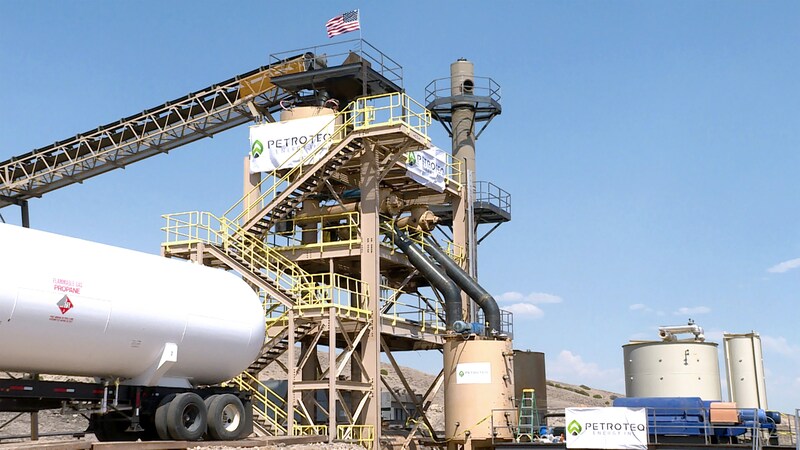 Material factors or assumptions were applied in providing forward-looking information, including: including the facility's emissions being less than the level required for an air quality permit; that Petroteq's extraction technology produces as expected, starting with 1,000/bod at its existing plant; the Company having the funds (through cash flow or financing) to fund the expansion of its plant as projected; and PetroBLOQ successfully developing and implementing a blockchain-based supply chain management system. While forward-looking statements are based on data, assumptions and analyses that the Company believes are reasonable under the circumstances, whether actual results, performance or developments will meet the Company's expectations and predictions depends on a number of risks and uncertainties that could cause the actual results, performance and financial condition of the Company to differ materially from its expectations. Petroteq's proprietary solvent-based extraction technology is unproven to produce on a commercial basis 1,000/bpd. Commercial production of 1,000/bpd at its existing plant is unproven and expansion at the existing plant or a new larger plant is subject to financing, development and testing to prove it is achievable and commercial. Certain of the "risk factors" that could cause actual results to differ materially from the Company's forward-looking statements in this press release include, without limitation: uncertainties inherent in the estimation of resources including whether any reserves will ever be attributed to the Company's properties; since the Company's extraction technology is proprietary, not widely used in the industry, and has not been used in consistent commercial production, the Company's bitumen resources are classified as a contingent resource, because they are not currently considered to be commercially recoverable; full scale commercial production may engender public opposition; the Company cannot be certain that the bitumen resources will be economically producible and thus cannot be classified as proved or probable reserves in accordance with applicable securities laws; PetroBLOQ not having the expertise and/or funds necessary to develop and implement a blockchain-based supply chain management system; PetroBLOQ not being able to develop the blockchain technology to completion; blockchain technology not being adopted by the oil and gas industry; changes in laws or regulations; the ability to implement business strategies or to pursue business opportunities, whether for economic or other reasons; status of the world oil markets, oil prices and price volatility; oil pricing; state of capital markets and ability by the Company to raise capital; litigation; the commercial and economic viability of the Company's oil sands hydrocarbon extraction technology, and other proprietary technologies developed or licensed by the Company or its subsidiaries, which are of experimental nature and have not been used at full capacity for an extended period of time; reliance on suppliers, contractors, consultants and key personnel; the ability of the Company to maintain its mineral lease holdings; potential failure of the Company's business plans or model; the nature of oil and gas production and oil sands mining, extraction and production; uncertainties in exploration and drilling for oil, gas and other hydrocarbon-bearing substances; unanticipated costs and expenses, availability of financing and other capital; potential damage to or destruction of property, loss of life and environmental damage; risks associated with compliance with environmental protection laws and regulations; uninsurable or uninsured risks; potential conflicts of interest of officers and directors; and other general economic, market and business conditions and factors, including the risk factors discussed or referred to in the Company's disclosure documents, filed with the securities regulatory authorities in certain provinces of Canada and available at www.sedar.com.